This is the second in a monthly series of artist interviews. I met the artist Tom Zarrilli during my early years in Atlanta. I knew him from openings at alternative galleries and music clubs like 688 and TV Dinners, where he was the manager. These are now defunct, but at the time were as ubiquitous in Atlanta as bands like the Hampton Grease Band, Thermos Greenwood, and Darryl Rhoades’ satirical HahaVishnu Orchestra. 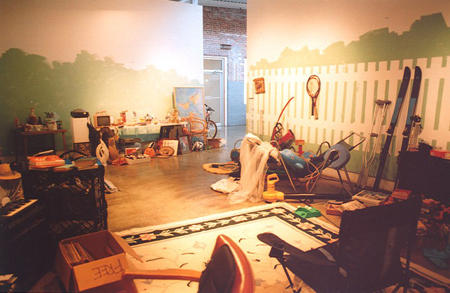 I exhibited in 1985 at Clark Brown’s Blue Rat Gallery, where Tom’s current wife, Cindy (Varnes) Zarrilli, was involved at the time. 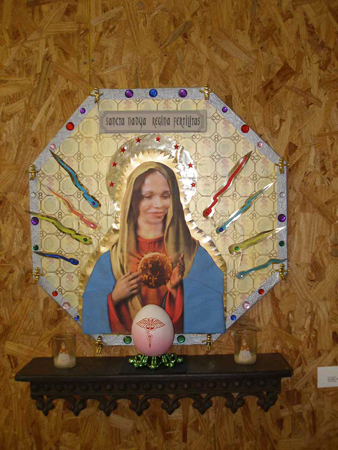 His recent exhibits have included a large installation, ‘A Year in the Yards of Clutter and the Driveways of Divestment’ at Atlanta’s Contemporary Arts Center, and his four state inventory of Makeshift Memorials. I reconnected with Tom via Facebook and asked him about his work. fd: Tom, I met you back in the early 1980’s through mutual friends; artists and musicians involved in Atlanta’s video and club scene. You were road manager for the group ‘Now Explosion’ and a manager at TV Dinners, a downtown club that featured mounted wall monitors playing looped experimental art videos. 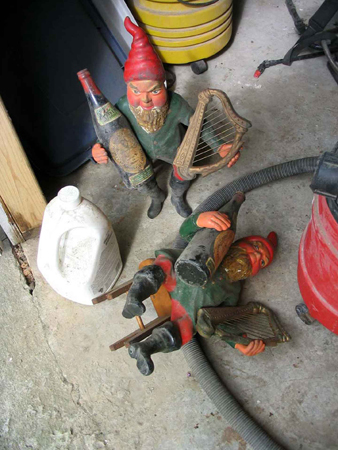 Can you tell us about your early background and how you got involved in both photography and yard sale or ‘found’ art. TZ When I was growing up in the Canal Zone, I began my interest in photography shooting whatever seemed fascinating to me. I used a Ziess Ikon my father had purchased on the black market in post war Germany. I found out early if you shoot a lot and on a regular basis you’ll come up with some great images. Some of my childhood pictures made their way into an installation I did last year entitled “I Still Dream of the Canal Zone”. In college, I took art history courses as well as drawing classes, but never considered myself talented enough to pursue a degree in the arts. I really never met any real working artists until I was an adult. I did little photography as a young adult, thinking this was better done by people with better gear and training. But I did fall in with a bohemian art crowd in the 70’s. 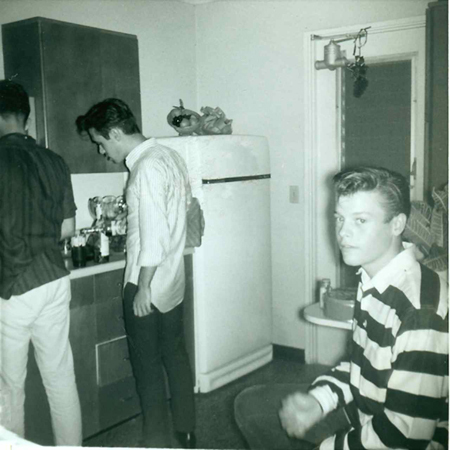 Teens with Booze, from ‘I Still Dream of the Canal Zone’ 2008. 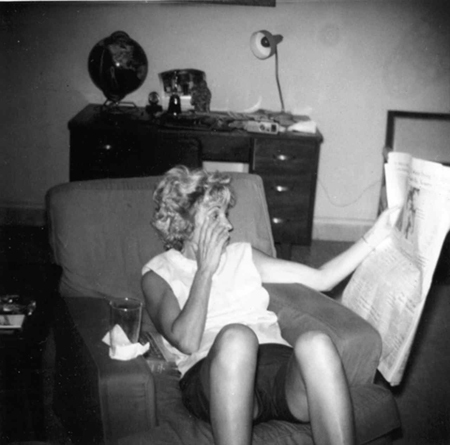 Mother reads Paper, from ‘I Still Dream of the Canal Zone’ 2008. After college I did a found music show on WRFG and wrote a music column for Creative Loafing. I started a comedy ensemble in the late 70’s that played around Atlanta for a few years. While I had no formal background in theatre, comedy made me realize that I was an artist and that one of the most important aspects of art was entertainment. 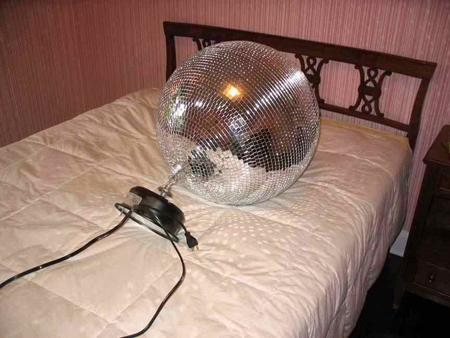 I later became very involved with the punk/new wave music scene in Atlanta and operated and managed several nightclubs. I began billing myself as a performance artist instead of a comedian. One of my shows was called “Tom Zarrilli’s Night of Self Indulgence”. It consisted of a monologue, some sketches and stunts like putting roaches on an overhead projector. In that era a lot of visual artists and art students were interested in music which was quite different than the previous progressive rock scene. I realized then that ideas were just as important as talent. My interest in photography was reborn in the late 1980’s when I bought a better camera, took courses and learned some dark room skills. fd: Your ‘Makeshift Memorials Series’ features memorial crosses in various parts of the country. Can you discuss the inspiration for these and how you view the series in your overall genre. I was always intrigued by random encounters with dramatic and disturbing visuals. 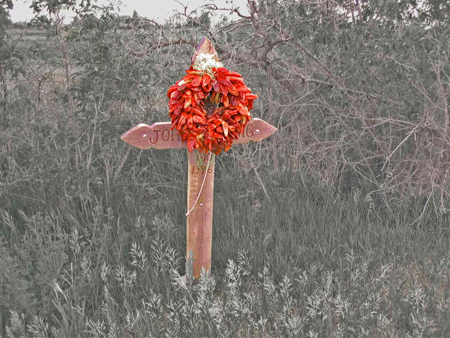 I also viewed roadside memorials as a form of naïve art. People who erect them do so out of a sense of loss. 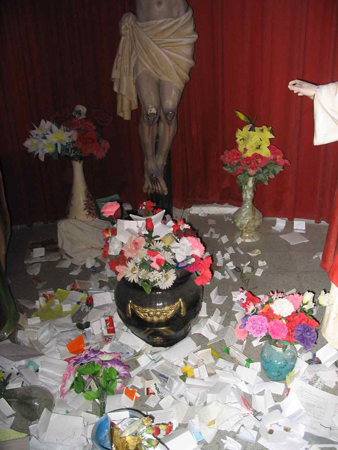 They are personally created visual constructs made by people who would never normally make any sort of visual display. It’s interesting now that there are companies who create ready-made roadside memorials for those who feel their own crafts and styling is lacking. It’s like buying a store-decorated cake instead of making one yourself. I also have a fear of driving and these grim reminders are very haunting to me. When I was camping near Chimayo, while photographing many wonderfully beautiful memorials, I was visited in a dream by the deceased spirits who were honored by these memorials. I’m not into psychic phenomenon, but it was a disturbing night with the dream accented by gunshots and incessantly barking dogs. fd: Who are some of your influences, whether they’re painters, sculptors, musicians, poets or ‘none of the above’? Man Ray, Duchamp, Jeff Koons, the late Atlanta artist King Thaxton. They all had a certain sense of humor about their work. I appreciate Joseph Cornell for his attention to detail. As for photographers, I appreciate the dedication of Margaret Bourke White and Gordon Parks to their art. I was also influenced early on by the films of Bruce Conner and the monologues of Spalding Gray. fd Do you work spontaneously or is there a set time that you dedicate to collecting these pieces for your series – on a daily/weekly basis? I work whenever I find the time. I do most of my writing and planning in the early morning. I’m easily distracted and that’s a problem for me. I need to go on a retreat. fd: How do you stay current, or is that important to you. Do you visit galleries and museums on a regular basis, or travel to view art and cultural events? A good idea never gets old, but I am always looking for new techniques and presentation methods. I do visit museums and galleries on a regular basis but I also have a love of historical buildings, miracle sites and roadside attractions. fd: Some artists suggest that the studio is too private for them, that they require a social forum for their work. Does networking with other artists and developing community have much bearing on your life as an artist and if so, how does it inform your work and process? I’m a very social person. Social networking sites and listservs are an important adjunct to my social life. At first I found my involvement and others’ involvement in them to be on the shallow side since there is no face to face contact. The Artnews listserv in Atlanta is a great vehicle for finding solutions to issues other artists and myself may be having with technique and presentation. It’s also a barometer of how some local artists feel about the current art scene and the politics and economics that surround it. fd: Exhibiting online or in galleries – I know that you have a few websites devoted to showing your work, including a blog on yard sales. Can you talk about where you’re currently exhibiting and whether a traditional gallery model fits (or not) with your work? Initially I saw it as the same difference between a live music club and hearing music on the radio. The latter was a good medium for finding out about music, but lacked depth and the experience of being exposed to live music as an audience member. Websites and online galleries are a great and inexpensive way to showcase your work, but lack the experience of seeing the work first hand and full size. This is especially true with large 3D pieces. There is no way a tactile and interactive installation can be replicated in an online gallery. It’s the difference between going on a carnival ride and watching a film of one. But it would be challenging to try to replicate this experience. Managing the websites I have is time consuming, and sometimes does not convey the full effects of what I do – but it is the best tool for promotion, especially since print media is dying so fast. fd: Any immediate plans for exhibits and/or the next series of work? At present I have a major outdoor installation planned for the fall at Agnes Scott College. I tentatively have a solo show scheduled at an arts center in Atlanta in 2010 that I hope to have new photography in, which will be perhaps a variation of the yard sale series. I am also revisiting the Makeshift Memorials series with some new images that I hope to have published in an online academic journal. I would love to do a photographic series on miracle sites, if I can afford the extensive travel required…there are not a lot of miracles happening in Georgia. 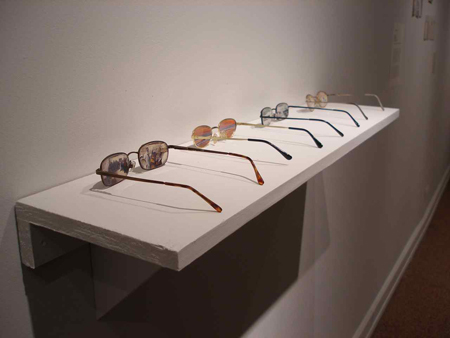 Spectacles for Tourists 2009 – from ‘All Small Redux‘ at Agnes Scott College’s Dalton Gallery. Visit Tom’s Yardsale Addict blog, and the Tomzarts site. See his youtube page for more videos, including archival footage of a young RuPaul and members of the band Now Explosion. Promenade – Pictures at a Yard Sale. Special thanks to Phil Elie for posting the Ginsberg clips on youtube. You can view his own charmingly surreal videos here. This entry was posted in Interviews and tagged alternative video, artist, avant-garde, blue rat gallery, clark brown, darryl rhoades, film, found art, hahavishnu orchestra, hampton grease band, interview, Music, music clubs, now explosion, original paintings, rupaul, thermos greenwood, Tom Zarrilli, video. Bookmark the permalink. Thank you for introducing me to this very interesting artist. As a Southern ex-pat I found myself longing for the giddy creativity that lines the streets, lawns and driveways of Red America. As always your curation and your questions are refreshingly eclectic! I look forward to the next installment.